Good things happen when everybody’s invited. A few years ago, we had the thought that phones (and stuff that hadn’t even been invented yet like tablets and smart watches) would be way more interesting if everyone could build new things together. So we created Android as an open platform, and put it out there for everyone to imagine, invent, make, or buy whatever they wanted. Since then, all kinds of people—from companies big and small to folks on Kickstarter, kids in schools, and crazy smart developers—have been innovating faster, together, more than we ever could alone. And the best part is that every time someone new joins in, things get more interesting, unexpected, and wonderful for all of us. Getting everyone in on the party is the same spirit behind Android One—an effort recently launched in India (coming to other countries soon) to make great smartphones available to the billions of people around the world who aren’t yet online. It’s also why we’re excited about Lollipop, our newest software release, which is designed to meet the diverse needs of the billion-plus people who already use Android today. As previewed at Google I/O, Lollipop is our largest, most ambitious release on Android with over 5,000 new APIs for developers. Lollipop is designed to be flexible, to work on all your devices and to be customized for you the way you see fit. And just like Android has always been, it’s designed to be shared. Lollipop is made for a world where moving throughout the day means interacting with a bunch of different screens—from phones and tablets to TVs. With more devices connecting together, your expectation is that things just work. With Lollipop, it’s easier than ever to pick up where you left off, so the songs, photos, apps, and even recent searches from one of your Android devices can be immediately enjoyed across all the other ones. As you switch from one screen to another, the experience should feel the same. So Lollipop has a consistent design across devices—an approach we call Material Design. Now content responds to your touch, or even your voice, in more intuitive ways, and transitions between tasks are more fluid. Lollipop also gives you more control over your device. You can now adjust your settings so that only certain people and notifications can get through, for example, when you’re out to dinner or in the middle of an important meeting. And when an important notification does come through, you can see it directly from the lockscreen. And because we’re using our devices a lot more, there’s a new battery saver feature that extends the life of your device by up to 90 minutes—helpful if you’re far from a power outlet. We’ve enabled multiple user accounts and guest user mode for keeping your personal stuff private. And you can now secure your device with a PIN, password, pattern, or even by pairing your phone to a trusted device like your watch or car with Smart Lock. But this is just a small taste of Lollipop. Learn more on android.com. Advances in computing are driven at the intersection of hardware and software. That's why we’ve always introduced Nexus devices alongside our platform releases. Rather than creating software in the abstract, we work with hardware partners to build Nexus devices to help push the boundaries of what's possible. Nexus devices also serve as a reference for the ecosystem as they develop on our newest release. 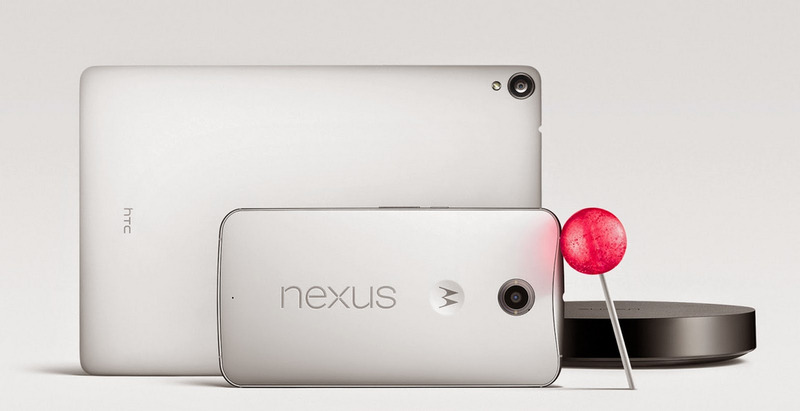 And for Lollipop, we have a few new Nexus treats to share with you. First, with Motorola, we developed the Nexus 6. This new phone has a contoured aluminum frame, a 6-inch Quad HD display and a 13 megapixel camera. The large screen is complemented by dual front-facing stereo speakers that deliver high-fidelity sound, making it as great for movies and gaming as it is for doing work. It also comes with a Turbo Charger, so you can get up to six hours of use with only 15 minutes of charge. Next, a new tablet built in partnership with HTC. Nexus 9, with brushed metal sides and 8.9-inch screen, is small enough to easily carry around in one hand, yet big enough to work on. And since more and more people want to have the same simple experience they have on their tablets when they have to do real work, we designed a keyboard folio that magnetically attaches to the Nexus 9, folds into two different angles and rests securely on your lap like a laptop. Finally, we’re releasing the first device running Android TV: Nexus Player, a collaboration with Asus, is a streaming media player for movies, music and videos. It's also a first-of-its-kind Android gaming device. With Nexus Player you can play Android games on your HDTV with a gamepad, then keep playing on your phone while you're on the road. Nexus Player is Google Cast Ready so you can cast your favorite entertainment from almost any Chromebook or Android or iOS phone or tablet to your TV. Nexus 9 and Nexus Player will be available for pre-order on October 17. Nexus 9 will be in stores starting November 3. Nexus 6 will be available for pre-order in late October and in stores in November—with options for an unlocked version through Play store, or a monthly contract or installment plan through carriers, including AT&T, Sprint, T-Mobile, U.S. Cellular, and Verizon. Specific carrier rollout timing will vary. Check out google.com/nexus for more details on availability. Android 5.0 Lollipop, which comes on Nexus 6, Nexus 9 and Nexus Player, will also be available on Nexus 4, 5, 7, 10 and Google Play edition devices in the coming weeks. With this latest release of Android Lollipop, we're excited to continue working with our developer community, hardware partners, and all of you. More ideas and more creators is what gets us all to better ideas faster. And since everyone's invited to the party, we hope you'll join in the fun by creating and sharing an Android character that captures a little bit of who you are—one of a kind. Enjoy!